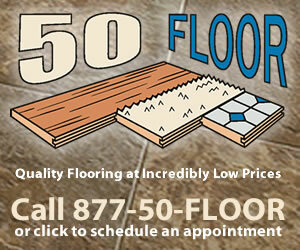 Thank you for choosing to contract with 50 Floor for your flooring installation. We greatly apologize for the inconveniences that you experienced during the installation process. We also appreciate you allowing us to make the floor installation matter right for you. Thank you once again for choosing 50 Floor. First time ever using 50 Floor and it couldn't have gone much worse. Prior to the installers arrivial I was excited about getting new carpet. I have everuthing removed from the rooms as the paoereork ststes to do...my kitchen is now full of 3 bedrooms worth of stuff. Thr installers arrive at the time they stated when they called me. They ask to see the bedrooms, i show them around. The lead installer asks me to come verify the purchase and thats where my good mood changes....the carpet the installers brought was blue-Official color is called Poolside...it is the wrong kind, wrong color, and wrong style of carpet Nothing close to the Mohawk Palisade 857 shade of brown i bought. The installer looks at the label, then calls his supervisor. My question is how many people looked at and verified this order before it was brought to my house? So now I sit here pissed off bc i cant get into or use my kitchen because its full of 3 bedrooms of stuff...if i put it back Ill have to move it all again ...no new carpet in my house and my anger level increasing as i replay the events. Just a huge inconvience and pain in the ***. Product or Service Mentioned: Fifty Floor Carpet Installation. Review #1025609 is a subjective opinion of User1025609.